Here is a list of resources for learning about babywearing, scientific research, vendors, and videos. It is by no means comprehensive at this time though we aim to flesh it out as much as we can in the future. Should You Wear a Baby Sling? Blois, M, MD. (2005). 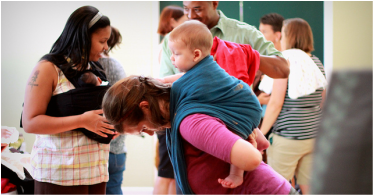 Babywearing: The Benefits and Beauty of This Ancient Tradition. Pharmasoft Publishing. Littlefield, Timothy R. "Car Seats, Infant Carriers, and Swings: Their Role in Deformational Plagiocephaly," Journal of Prosthetics & Orthotics 15, no. 3 (2003): 102-106. Bauer, J., Sontheimer, D., Fischer, C., & Linderkamp, O. (1996). Metabolic rate and energy balance in very low birth weight infants during kangaroo holding by their mothers and fathers. Journal of Pediatrics: 129., 608–611.